Who doesn’t need more recess? Kids do. Adults do. We all do. 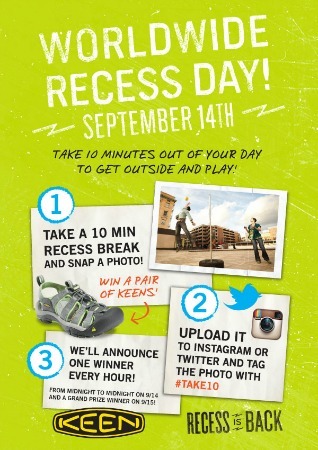 So this Friday, Keen [you know the great outdoor footwear company] has declared Worldwide Recess Day. Why not? Get out and Run. Walk. Bike. Play soccer. Go to the playground and swing on the swings. Ride your skateboard. Jump in the creek. swim laps. Play 4 square. Shoot baskets. Just get outside and play. Do something. Do anything. Spend 10 minutes At Recess this Friday. Then take a photo and send it to Keen for a chance to win a pair of Keens. They will be giving away a pair an hour. It could be your lucky day! I’m planning my recess. What are you going to do on your recess?